~ Sigourney Weaver, Starlog #247, 1997. One complaint regarding the third movie’s Alien was the abandonment of its modus operandi. The creature, fans complained, made no effort to secure hosts for its Queen, nor were there scenes to parallel the Alien’s mysterious appearances in the first movie. Originally, the creature was to cocoon its victims just as its forebearers did, but, according to Tom Woodruff, “the plug was pulled because Fincher’s idea was that the creature simply kills to eat.” And so instead, it gored and chewed on its victims, tugging at their carcasses like a rabid dog. Since Resurrection was the first movie to show the Aliens in captivity, there are some attempts in the various scripts to elaborate on their abilities. Brad Dourif’s Dr. Gediman explains (in one of Ripley’s dream sequences) that the Aliens communicate “through ultrasonic soundwaves. Sort of like bats.” Though this information is imparted through one of Ripley’s nightmares, she later tells Call that she can feel the Alien presence “In my head. Behind my eyes” much in the same way. We learn more about the Aliens’ sensory abilities throughout the drafts, such as their ability to “smell fear” and to adapt situationally to threats. In one scene, we find that some caged Aliens have been observing Dr. Gedimen as much as he has been observing them: once his attention slips they launch an attack on one of their own, spilling its intestines upon the steel flooring, melting it and providing an escape. The Aliens swiftly incapacitate the scientists and elimate the military personel so effectively that commanding officer General Perez can only liken it to a “military strike”. ~ Jean-Pierre Jeunet, Starlog magazine, 1997. By the end of the film we discover that the genetic gambling that the Auriga’s scientists partake in results in an entirely new creature altogether, an amalgamation of human and Alien DNA that takes the form of a spindle-limbed albinoid called the ‘Newborn’. Born in the murky bowels of Waste Tank No. 5 and ripping itself from the Alien Queen’s egg sac, the Newborn quickly rejects and murders the Queen before seemingly imprinting itself on Ripley, whose scent it recognises as being neither entirely Alien nor human, much like itself. In the first draft the Newborn is described as being almost as big as the Queen, with four forelegs and two thick haunches, pincers on its head and a webwork of red veins that cover its long eyeless head, like hair. In this draft, the Newborn drains the blood from its victims through its tongue, tries to attack Ripley, and is staunchly defended by the hive. Aided by ‘drones’, the Newborn chases Ripley throughout the ship, rides the Betty down to Earth, is bombarded with rocket-fire from Call, immolated in the Betty’s thrusters, and goes on the run across Earth’s landscape where, after being fought by Ripley, it unfurls a pair of “batlike, leathern” wings that drip with slime. After another battle between the Newborn and a futuristic combine harvester (piloted by Call), the creature is shoved into the propelling blades by Ripley herself. The second draft also features a battle on Earth between the Newborn and the Betty crew, and though it is less bombastic and outrageous than the first draft, it does come with further embellishments to the Newborn as a character: it now laughs after using DiStephano as a human shield, it “sighs in quiet ecstasy” as it surveys the Earthly city before it (Paris), it licks its lips as it hones in on a band of children, and expresses outrage when it mistakenly devours some of Call’s android blood, which is revealed to be, somehow, magnetic. The Newborn, with Call’s blood in its belly, finds itself stuck to an electromagnetic crane, dropped into a compactor, and finally crushed and impaled. The Newborn’s death in the film resembles one planned demise for Lambert in the original Alien, but there was another hull breach in the Resurrection screenplays that has one of General Perez’s soldiers being “sucked through a hole no bigger than his fist” after he ill-advisedly shoots an Alien onboard the Auriga. This simple but gruesome gag replaced the high-octane chases and battles that Whedon had originally planned for his finale, and the finale is probably the better for it: as ill-received as the Newborn was, its death throes were horrifying and touching: it is hard to not pity it, as revolting as it is. Before the film’s release producer Bill Badalato opined that “The Aliens are truly characters in the story and not just background. The characters interact with the Aliens in a way that we haven’t seen before in an Alien film. It’s extremely effective.” But Weaver, whose mission statement had been to portray the Aliens in a more eldritch and frightening manner, expressed some disappointment at the results. “I was surprised by how much monster movie there was in Resurrection,” she admitted to Starlog. She was, however, happy with ADI’s animatronic Newborn. “For me, playing opposite the Newborn was like playing opposite Lon Chaney Sr.,” she said. “This creature could do everything. It was immensely moving and all of my interaction with it came out of improvisation, not from the script. The Newborn was a creature operated by 14 puppeteers. They gave it energy. It was very eerie.” Conversely, many fans disliked the new creature, and complained that the Aliens themselves largey vanish in the third act. 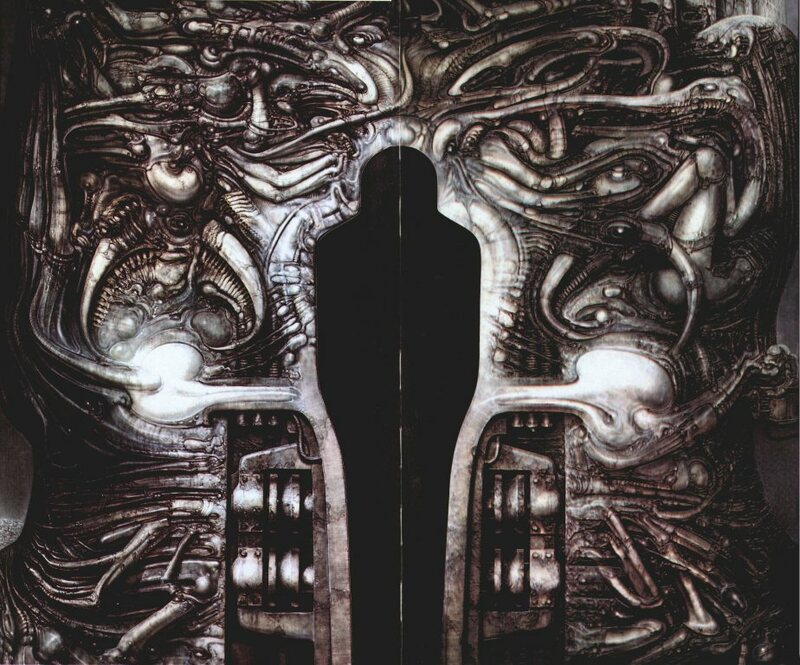 Fox, in the end, restored Giger’s credit for Resurrection‘s home release, but this did not spare them from the artist’s pointed thoughts on what the studio had done with his Alien after taking it out of his hands. ~ HR Giger, Alien Evolution, 2001. Another great article, Nice to see a new one keep it up. Giger is right on the money here: the main obstacle to enjoying Resurrection is how utterly fugly the aliens are. Not only the unfortunate newborn design, but every time AD redesigns the Alien it keeps loosing shape and detail and looking more and more like tom woodruff covered in steaming boogers. I wonder if they’ll be doing the aliens in the new prometheus. That sounds like another terrible movie in the aliens franchise. Great article about a terrible movie. And once again my dislike of Wooodruff and Gillis legacy upon the alien films. The line in the article about Woodruff wanting to improve on the alien still makes me cross. Because it’s utterly idiotic and deluded especially once you see the KY bathed crap he and Amalgamated came up with. And I’m not just talking about the newborn but the aliens themselves, which looked like someone had tried to make a monster out of some old half chewed bubblegum. It’s just horrifying to imagine the difference between how Whedon envisioned the movie and what we’ve got. From Jeunet to the effects artists, they all just… horribly butchered this script into oblivion. Joss Whedon should have directed this, plain and simple. The final film is better than the script. Budget cuts necessitated some action scenes be cut (Ripley having a fight with an Alien when she meets the Betty crew, rather than simply blowing its head off, for example), but a lot of appallingly bad Whedon dialogue in the script was mercifully cut. And no one else but Whedon was responsible for those scenes where they just stand around and have a chat, thus draining the tension out of the thing. I love Whedon’s Avengers flicks – both of them – but the first was a very predictable paint by numbers script where everyone spoke in much the same voice, with much the same sense of humour. I think the guy is talented, but ultimately over-rated. And blaming everyone but himself for Resurrections flaws, as he has in the past, screams ‘hack’. I always felt Whedon had a bit of a nerve making those comments about characters we don’t know getting killed in Alien 3 considering the amount of expendable grunts that buy it in Resurrection. What’s sauce for the goose is apparently not sauce for the gander. Similarly I have never understood his comments regarding how Jeunet executed his script ‘wrongly’. It looks like what it is on the page – comic book characters in a comic book story. It was his mistake to try to adapt a mature and elegant series into an adolescent fantasy where the laws of Newtonian physics don’t even apply (dodging bullets and the like) and characters have cartoon sensibility. I think there’s only two nameless grunts really that get killed by Aliens – on screen at any rate. Not counting those shot by Christie. He did have a point about Alien 3. Even many supposed fans of that film can’t tell the bald Poms apart 25 years later. Which certainly wasn’t the case in Resurrection – even if they could be cartoony, at least you could tell them apart. I remember Thomson’s take on Resurrection being pretty painful, but I’ll definitely give your piece a read. Had a read – “maddeningly superficial” sums up Thomson’s book perfectly. The only question Shaw will ask if she ever reaches the Engineers homeworld. Been awhile since I’ve been here. It’s nice when you randomly click on a page like this and find new content. Still looking forward to the article on David Twohy’s Alien 3 script. Uh-oh, is Valaquen delving into the mess that is Alien Resurrection? While I would thoroughly enjoy his customary dissection and analysis, I fear that the task of making sense of that film may prove to be a mountain too high…….. I still dont find A:R anywhere near as painful as prometheus. Maybe ridley scott actually making that catastrophe himself pours salt in the wound more, or lindelof smearing his lindelof on it. I think it shows maturity to delve into a film you don’t like and come out with an article largely devoid of snark. Okay, now we know who’s most deserving of our pitchforks! The execution was great. I think the creatures looked pretty good from a technical point of view. It was the concept design what was a bit off. However, given the theme of the movie, it makes sense that they don’t look like the Giger’s xenomorph. Alien: Resurrection is my favorite of the franchise so far. I thought that at 8 years old and I think that now. The combination of being in space, the heavy metal confines of the ship, that old VHS/tape/DOS feel to all the key pads, consoles, and computers – as well as, of course, the distinguished ALIENs on board, threatening the survival of the humans just set such a magnificent atmosphere that I could remember and relive it even after over one and a half decades. The fact that Ripley was super human was just an added bonus for me. However, as I’ve ventured through the internet, I’ve discovered that I might be a minority. People seem to dislike this movie – their majority-mass barking not helping me understand their case. Or perhaps I was just finding the wrong comments, on the wrong websites. A few commenters mentioned some rational and logical points, and their opinions are theirs, rightfully. Notwithstanding, there’s no love lost for the poorly written comments that vaguely (at best) portrays the movie as, and I quote, “sh!t,” (censored and abridged for respectable audiences). I’m counting down the days until Alien 5 is released. I hope it is released. I hope that, whatever happens, it has the same atmosphere as the older movies. I’ve got a collection of Alien movies and games going on! Don’t keep me waiting long now!